Why Build a Productized Service (Instead of Software)? When you’re plotting your way out of freelancing or a job into something more scalable, it’s common to think there’s only one clear path: Build software. Afterall, that’s what 37 Signals (Basecamp) did, along with so many other web workers turned successful product business owners. With the abundance of these types of “success stories”, there’s no wonder so many of us immediately turn to software as our ticket out of working by the hour. But what we don’t hear enough of are the stories of all those founders who invested years, working (for nothing) on a software idea (or two) that didn’t pan out. I certainly have a few of those. That’s not to say making the leap from client work into a SaaS is impossible. You won’t hear me say it’s not a path worth pursuing when the time is right. But what I am saying is this: If what you’re after right now is something more scalable than billable hours or full-time employment, then you’ve got options. One of those options is a Productized Service. And it might just be the best opportunity you’ve got, simply because so many others in your position are overlooking it. Yeah. You know, a value-added, systemized, “done-for-you” service, packaged neatly as a product with a defined scope and price. A productized service thrives when it’s tightly focused on delivering one specific service exceptionally well. It also adds value in unique ways that neither a piece of software nor a freelancer is able to provide. Software is “Do It Yourself”. A piece of software is nothing more than a tool that the customer can use to accomplish a task themselves. No matter how intuitive the UI is, software alone doesn’t remove the customer’s time from the equation. If they want the results the software promises, then they must be willing to put in the time to do it themselves (using the software). 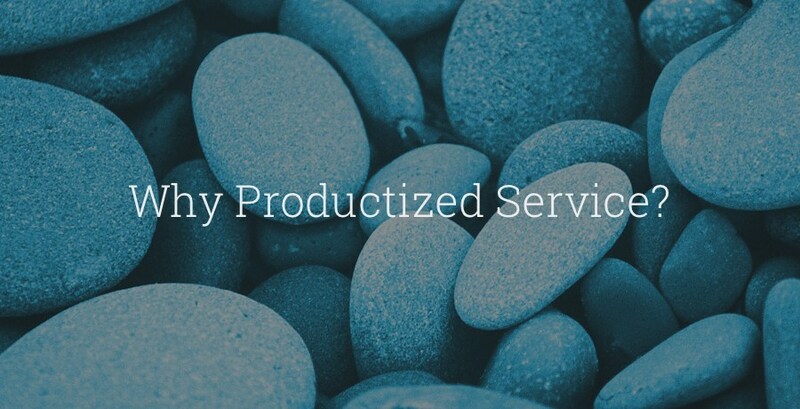 A Productized Service is “done for you”. In other words, it’s a faster, and often more effective way to give the customer the result they want. The customer doesn’t need to invest any of their own time, nor do they need to learn any new skills or techniques or software. This aspect alone adds significant value to the equation. Check out what Freedom Podcasting is doing. Their customers want to a specific result: A successful podcast. So what the team at Freedom Podcasting does is they handle all of the legwork for them – Audio editing, publishing episodes, podcast artwork, directory submission, and more — Just about everything except for speaking into the mics and hitting record! One of the biggest challenges most Software as a Service (SaaS) companies face is a high cancellation rate, a.k.a. churn rate. They realize they’re not using the software as much they thought they would when they signed up (perhaps due to lack of time), so they cancel. Or they come across a better solution (cheaper or more effective or both), so they cancel and switch. Or (hopefully) they’ll become increasingly engaged in the software and remain subscribed for a long time to come. It’s very very difficult for most SaaS products to achieve that 3rd outcome the majority of the time. Solving the churn problem becomes their biggest hurdle. A Productized Service, on the other hand, has a much easier time combatting cancellations. Why? Because the most common reasons for cancellation are removed from the picture. Customer doesn’t have the time to do it themselves. A Productized Service does the work for them. The results don’t live up to the promise. A Productized Service takes a hands-on approach, delivered by experts who ensure this doesn’t happen. The UI or workflow is too confusing. A Productized Service isn’t reliant on a UI to be effective. My productized service, Restaurant Engine, has benefitted from a near-zero cancellation rate. That’s mainly because we personally design and setup every new customer’s website, ensuring it looks amazing and meets every one of their needs perfectly. And as a productized, streamlined service, we run this process for multiple customers every week. I don’t believe that the market for a product is truly “validated” until it has multiple paying customers. During the planning stages of a new product launch, you can do some “soft validation” stuff like collecting emails on a landing page, or pre-selling a product before it’s built. But even pre-selling can’t guarantee customers will realize the value over the long term (and not cancel). A productized service is often created out of a service that you’ve delivered before as a freelancer or at a previous job. That means you’ve already seen first hand that clients/companies have been willing to pay for such a solution. This gives you a strong sense of validation right from the start, as you begin the work of productizing that service. I call this a Pre-Validated idea. When I started Restaurant Engine, it wasn’t a question whether or not restaurants needed website design and are willing to pay for it. In fact, I had previously had a few restaurants as clients when I was a freelance web designer. But even if I hadn’t, it’s doesn’t take a leap of faith to assume that small businesses like restaurants need a relatively low-cost way to get a professionally designed website. Since I started with a pre-validated idea, I could move forward with with the work of figuring out how to streamline, sell, and scale up such a service. When you’re bootstrapping your transition out of client work or a nine-to-five, you’re perpetually racing against the clock. How long can you go until you run out of savings to keep your bills paid during your transition? A productized service helps you sustain your runway longer by getting your first customer revenue in the door faster and easier. As a value-added, “Done For You” service — often targeted at businesses — you can charge a higher price. You can often require first payment up-front, rather than rely on free trials to convert leads to customers. You don’t need thousands of customers in order for the business to be profitable. A typical productized service only requires a handful of paying customers on a monthly retainer to be sustainable. You also don’t need to spend months developing software before the product can “ship”. A productized service can launch in a matter of days to paying customers, then iterate and refine over time. With your early revenue from those first paying customers, your runway is extended. Now you can continue to push forward, scaling up your operation and increasing bandwidth. Compare that to bootstrapping a software product on the side, which often requires a number of periods where you must pause to take a client project just to keep the lights on. Finally, here’s the reason why building a productized service is the perfect opportunity if you’re bootstrapping: Most others in your situation are overlooking it. While the rest are chasing after the shiny SaaS ideas or throwing iOS apps at the wall to see what sticks, you can be signing up paying customers with nothing more than a landing page. While the rest avoid doing anything manually “because it doesn’t scale”, you can capitalize on that opportunity. The opportunity is systems. Most of your peers aren’t interested in systems, procedures, and streamlining operations. But to you, the productized service business owner, systems are the key. They’re what will allow you to turn a manual, hands-on, value-added service into a product that can be run with or without you. That could mean streamlining certain procedures, hiring key team members, utilizing 3rd party tools, or eventually building out your own software to make your process even faster. And here’s a bonus 6th reason why a productized service is a better opportunity than building software: It’s a fantastic way to learn. The founders that never stop learning are the ones who go the farthest. On the product-level, you have a more intimate relationship with every customer, so you’ll learn and refine your value proposition faster than you would with impersonal software. And when your processes are largely delivered manually, you learn where the friction points are, making it easier to streamline and automate. But at a high-level, building a productized service is your opportunity to learn what it means to go from being a freelancer to being a business owner. You’re learning to work on the business instead of in the business. That means focusing on processes, building a team, creating value.